One of the changes that I alluded to yesterday has to do with the latest addition to the family. Meet Feeny (as in Mr. Feeny from the hit series, Boy Meets World). Feeny was my youngest’s puppy that she purchased shortly after obtaining her first apartment. Her theory – and one that I supported 100% – was that she would be lonely in an apartment by herself when all her friends were away at college. She wanted a puppy to keep her company, as well as provide added security. What we both failed to realize was that the schedule of an 18 year old student and a basset hound puppy do not mesh well together. Mandy is the assistant manager at an upscale coffee shop where she works about 25-30 hours a week as well as taking about 15 hours of credit per semester at the community college. If she wasn’t working she was studying and if she wasn’t studying she was going to class. Feeny is a great dog – but he is definitely a puppy and needs far more attention than our three yellow labs. Both of us forgot this key ingredient. Mandy’s frustration got the better of her and she was ready to give Feeny up for adoption. Well, for those of you who know me, you know that I could not allow that to happen. He had become a part of our family and I could not simply discard him because of a bit of inconvenience. So the day after Christmas Feeny became my puppy. Not exactly the way I had planned to spend my Christmas break, but when duty calls…. He has assimilated well into the household – although the older dogs have had to teach him the proper pecking order – and he is about 70% house trained. He is a bit insecure and immediately barks when I leave the room, but we are working on those issues of separation anxiety. I have quickly learned that Basset Hounds are a unique breed – not just in appearance but in personality as well. I would welcome any suggestions for training dear Feeny (C.B. — do you have any words of wisdom to impart?) – as he is definitely here to stay. Aw, what a sweetheart! My son would enjoy a dog, but he doesn't have time for a puppy either. I bet James could write a book about basset behavior! haha Well, you are in good company with me because we seem to accumulate animals. Can't turn them away. He has the sweetest little face. And maybe once he is through the puppy stage and your daughter gets into a more manageable routine, he can go back. teeny is absolutely adorable! I'm sure your daughter is so happy that you were able to take him! Good luck on the training…that's the only thing about puppies that is so hard! Congratulations on your newest addition to the family. I love the name and enjoyed that series so much, back in the day. I have no training tips as my dog is now 6 years old and still acts a bit spoiled and entitled most of the time! He's so cute! I love Boy Meets World lol. Molly – you did a good thing adopting Feeny! 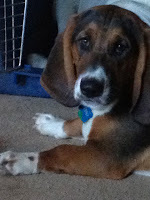 He is adorable…I love Bassetts. The other person who owns a Bassett who might be able to give you pointers is Jill. Such a sweetheart! I am so glad you are able to take him in, Molly. I am sure your daughter appreciates it too. We have had issues with my dog of 11 years and the baby, unfortunately, and in a desperate moment I considered rehoming him. My mom said she would if it comes to that but I am hoping it won't. It does bring me a great deal of relief knowing she would take him though and he would still be in the family. Feeny has such a sweet face and you are so good to take him in, Molly! I don't have any experience with Bassetts (Greyhounds and Bernese Mountain Dogs are another story), so I can't offer much advice. Good luck. He's a cutie. We got Dakota as an adult for a rescue. She's still just about 98% house trained. Bassets will work for food. Keep a bag of kibble in your pocket when you walk him and keep kibble handy at home. Always reward the behavior you want. If he's barking, call "here" and give him some kibble when he comes and sits quitely. He'll learn to come here every time you call. Never ever punish him, even a little, after he comes and sits. Housebreaking can be problematic. You can keep him overnight in a smallish space, say a bedroom. He should begin to see this as his den. Dogs usually wont' go in their dens. You can then expand his den to include more and more of the house over time. Dont' be afraid to try crating him overnight if you need to. Dogs see a crate as their den and quickly get used to it. Always use a dog harness when he's in the car. One sudden stop and you've got a thousand dollar vet bill for a hip or leg injury. Be very strict when you walk him. I let Dakota sniff where she wants to only about one out of ever 25 tries. The rest of the time she has to stay close to me and keep up with us. Bassets will sniff everything and you'll never get anywhere if you let them have their way. Keep him on a diet so he doesn't gain weight. You should always be able to see his ribs. If you can't, he needs to diet. There's probably much more to say. Feel free to email me if you need to know anything. If I don't know the answer, C.J. probably does. I suggest, finally, that he get lots of time with other dogs his own age. We think Dakota never got this, and now she has no idea how to play with other dogs. Oh, those eyes! You could not possibly refuse that face. James has offered some really good advice; he is absolutely the expert on all things Bassett (and otherwise). Enjoy your newest family member, Molly. He's worth it! Well I'm a little bit jealous because we were researching dog breeds yesterday and I finally figured out that the breed we want to get next is a Basset Hound. They are just so cute and the perfect size! Of course we are a one dog at a time family, but now that I know what I want I can get my husband used to the idea over the next five years or so. 🙂 Your puppy is absolutely adorable! Awww…he's cute! And I think he'll learn quicker because he has older dogs to emulate! Enjoy him! Adorable! 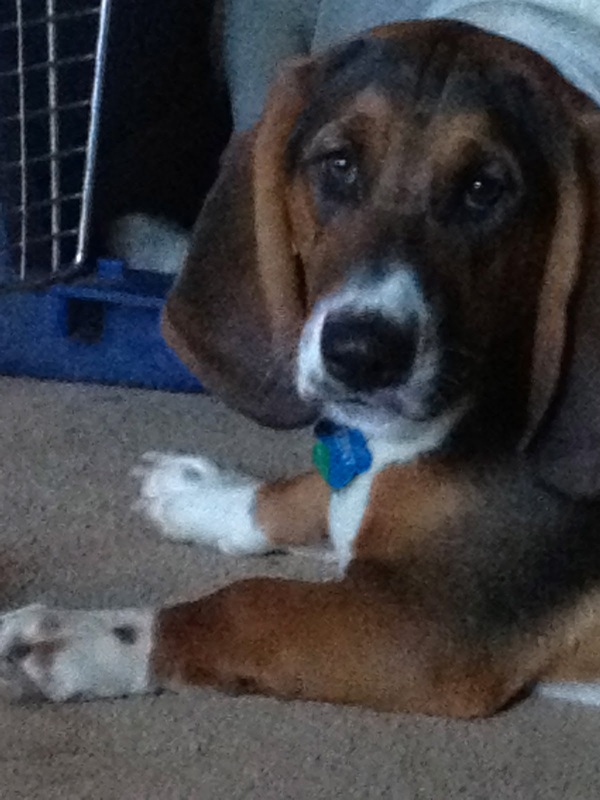 We should introduce Feeny to my basset pup, Tallulah. She's four months old, so we are still working on training, but she has definitely earned a place in our hearts. What's even better is that our old dog, a golden, loves to play with her. Lots of love, patience, and lots of treats will do the trick on training. Bassets are notoriously stubborn, so patience is key! Good luck!